Kathy Brennan is a freelance editor and writer. A winner of the Bert Greene and James Beard Journalism Awards, she was a long-time editor at Saveur, and also worked at Gourmet and Food Arts. Caroline Fennessy Campion has been a contributing writer to The New York Times, Details, Cherry Bombe, Compass, Redbook, and Martha Stewart Living; and she is the creator of the award-winning food blog DevilAndEgg.com. She was also an editor at Good Housekeeping, GQ, Glamour and Saveur. Our lives overlapped even before we started collaborating on cookbooks. Both of our moms immigrated to the States in the early 1960s—Caroline’s from Belgium, Kathy’s from Japan. They were also terrific cooks who married Irish-American men with a taste for meat and potatoes, which often made for eclectic dinners (shrimp tempura or moules frites one night, pot roast and mashed potatoes the next). From our mothers we developed a passion for cooking, though it’s probably more accurate to say it became an obsession for both of us. Once we had kids, our impulse to cook became even greater. We met in the early 2000s while working as editors at Saveur magazine in New York, arguably one of the dreamiest jobs in the food world. We were both mothers of young children, trying to balance work and family. And it was there—in between all the editing, writing, eating, and traveling—that we unwittingly began to hatch the idea for writing a cookbook together. Many of our desk-side chats began with a simple question, “What are you making for dinner tonight?” and the resulting recipe swaps, cooking tips, and pep talks were lifesavers during those hectic days. After we both left Saveur and began freelancing while living in the suburbs, we found ourselves talking more frequently about the difficulties of putting home-cooked food on the table each night. Although neither of us was commuting anymore, our kids’ increasingly packed schedules made it tough to find the time and energy to cook from scratch. 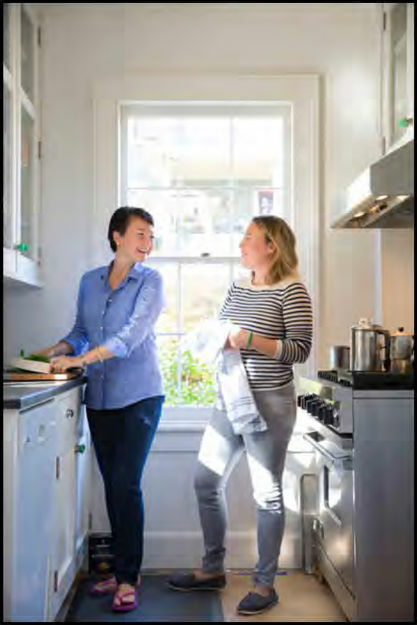 The saving grace for us was that over the course of our careers, we had picked up all kinds of kitchen moves that enabled us to put good food on the table under even the most challenging circumstances (a hungry toddler clinging to the leg—that sort of thing). Kathy had gone to cooking school, we had both worked in restaurant kitchens, and we were food editors and writers. Those were definite advantages, and from conversations with friends and acquaintances, it became clear that dinnertime was a source of frustration and guilt in many households. Despite America’s so-called food revolution and all the television shows, publications, and websites it had spawned, people were still struggling to find a way to balance their incredibly busy lives with their desire to cook. They wanted family meals, they wanted to serve good, nutritious food, they wanted a diverse repertoire of dishes, and they also wanted to find a little pleasure in the process. They just didn’t know how to make that happen night after night. It was during one of our marathon phone calls that Kathy suggested we team up to write a weeknight meals cookbook full of recipes that are “keepers” alongside lots of practical guidance and encouragement—a cookbook that would share all the kitchen knowledge that we had accumulated, with the aim of making people more efficient and happier cooks. That was the impetus behind our first book, and with this one the recipes have changed, but the goal remains the same.